The What: Visix is now shipping the full release of the AxisTV Alert software application for digital signage. This standalone alerting platform can be used with any content management solution, including Visix’s own AxisTV Signage Suite, and integrates with popular third-party alerting suites like Alertus and Rave Mobile Safety. The What Else: AxisTV Alert is built around Common Alerting Protocol (CAP) standards, and has been designed for high reliability, scalability, and performance. 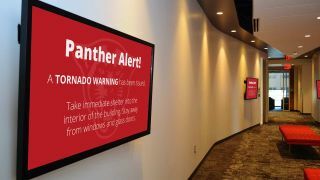 The user interface is streamlined and dedicated to alert functionality, with time-saving workflows to ensure that critical alerts and updates can be sent across a digital signage system in seconds. Clients can use the app to send out emergency alerts, safety notices, or important reminders, with multiple messages running on the system at once or a single message overriding all screens for a selected time period. The Bottom Line: The platform combines a central alert management application (AxisTV Alert) with playback software (AxisTV Siren) for an unlimited number of players, and can be used with both on-premise and hosted signage systems. AxisTV Alert uses asynchronous and multi-thread processing for high performance while consuming CAP messages from third-party mass notification vendors and rapidly communicating with media players running Siren.